The MicroScout brick has one motor, a light sensor, display and can make R2D2-like beepy noises. It has 7 built-in programs, and a mysterious “P” mode in which it can be respond to external commands and can even be programmed via the light sensor. 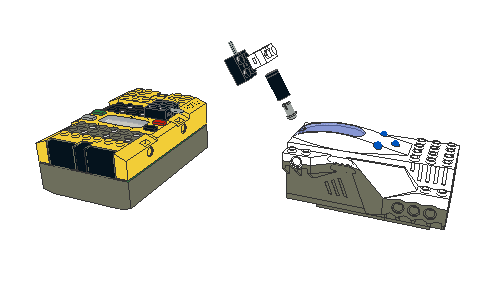 LEGO calls this Visible Light Link (VLL), and it has been used in other bricks as well, like the Code Pilot. So I decided to hook up a standard LEGO 9v Light 2×1 brick to one of the OUT ports on my RCX, and see if I could get it to work. Here is the setup (and my first attempt at Leocad): The lamp doesn’t really show up well in the above picture, but it’s simply one of these. This entry was posted in MicroScout, RCX and tagged MicroScout, pBrick2pBrick, RCX, VLL on 2013/10/04 by Michiel.